1.The accommodation booked under this ticket is not transferable. 2.The voucher is to be carried by the passenger during the journey along with the photo identity card in original and is valid only when presented with this photo identity card. If the relevant photo identity card is not accompanied with this voucher, it will be considered as ticket-less travel and treated accordingly. 3.The exact train timings are subject to minor modifications. All the travelling passengers must reconfirm the timings with IRCTC, corporate office before the start of their journey. 4.On demand from ticket checking staff the passenger should produce this voucher along with the above mentioned photo identity card. 5.Indian Nationals must carry a government issued photo identity card (passport, driving license, PAN card etc.). 6.IRCTC reserves the right to refuse booking or travel of any passenger without assigning any reason. 7.No refund or adjustment will be made in the event of interruption / non-use of full or any part of the tour or tour service by a tourist on his own after the commencement of the tour or closure of a sightseeing place or monument due any unknown reasons or closure on account of the decision /order of the local municipal administration /any other government authority / unforeseen events, circumstances, situations etc. 8.In case any sightseeing being missed on account of the delay in local transportation buses / train due to the reasons beyond our control, no refund shall be made. 9.Being a group tour, passengers would be required to share the bus / buses and train accommodation with other passengers. In case any passenger / passengers wish to travel in separate bus/buses, he/she should inform IRCTC at least one month in advance. IRCTC would try to make appropriate arrangement for which passenger / passengers would be required to make additional payment. For the smooth operation of the tour, passengers would need to adhere to the instructions given by the Tour Manager from time to time. 10.Train / Road journey time may exceed the expected travel time due to unforeseen circumstances such as traffic jams, break down of buses etc. This may result in late meal service, shortened / late/or no sightseeing etc. 11.Meals in hotels and on train are of pre-fixed menus and are generally decided keeping the palate of the overall tourists. Menus according to the specific preferences would not be possible. 12.As per the tour itinerary, hotel rooms at certain places are only provided for wash & change purpose. Passengers should not expect rooms to be given to them for longer duration. Check-in at hotel rooms at certain places may be delayed to the due delay from hotel in providing the rooms. 13. a] AC First class - has cabins with 4 berths (two lower & two upper). The cabins can be locked from inside as it has a sliding door. b] AC First class Coupe - has cabins with 2 berths (one lower & one upper). The cabins can be locked from inside as it hasa sliding door. 14.Passengers are required to take care of their luggage / belongings themselves. IRCTC will not be responsible for any loss or damage of any of the luggage / belongings at the Railway Stations / Train / Bus / Hotels etc. 15.It is the responsibility of the tourist to carefully read and fully understand all the terms and conditions / services to be offered / type of services to be offered etc. of this tour before making booking. In case of any doubts / clarifications, the same should be cleared with IRCTC before making the booking. (a) Accepting the changed arrangements or transferring your tour to another available tour date. (b) Cancelling or accepting the cancellation where you will receive a refund of payment without interest remitted to us. However, there will be no refund of any service such as pre /post tour accommodation, airline tickets, visa charges etc. that have been booked by you and /or your travel agent. 17. Trip would be operational subject to booking of a minimum 60% of total occupancy on a particular trip & IRCTC reserve the right to cancel/modify the trip at any time without assigning any reason whatsoever. 18. Do's & Don't in context of Wildlife must be strictly followed. 1. Enter the Park with a valid permit. 2. Take official guide with you inside the Park. 3. Drive slow; maximum speed limit is 20 km/hr. 4. Always carry drinking water. 5. Maintain silence and discipline during excursions. 6. Allow the animals to have the right of the way. 7. Wear colors which match with Nature. 1. Don't get down, unless told by the guide. 2. Don't carry arms, explosives or intoxicants inside the Park. 4. Don't litter with cans, bottles, plastic bags etc. 5. Don't try to feed the animals. 6. Don't smoke or lit fire. 7. Don't tease or chase the animals. Indian Railways in collaboration with IRCTC proudly announces Tiger Trail Circuit by Semi Luxury Tourist Train. India is known as one of the favorite place for Tiger sightings in the world. IRCTC proudly launches the departure of its new itinerary on Tiger Trail Circuit by Rajdhani type Air-Conditioned train and all surface transportation by A/C vehicles. Semi Luxury Tourist Train & A/c Transportation. 8. Don't leave Plastic/Polybags.Indian visa fees, if any. Items of personal nature, e.g. Laundry, Medicine, Alcoholic drinks etc. Road Transfers to and from Delhi-Safdarjung Railway Station. Hotel stay in Delhi before & after the trip, air ticket, visa charges etc. Any other services not mentioned in Package Price Includes. Fees for Still/ Flash Video camera at the monuments and other places. Departure from Delhi's Safdarjung Railway Station at 1430 hrs. Dinner & Overnight on board. Morning Breakfast proceed for Kanha. Arrive at Kanha check in & lunch at Hotel. Later proceed for evening safari (Mukki Zone). Dinner & overnight at Hotel. Morning safari (Mukki Zone) in Kanha late morning Breakfast. Lunch at Hotel. Evening time for leisure. Dinner & overnight at Hotel. After Breakfast proceed for Jabalpur (135 Kms Approx). Lunch at Hotel in Jabalpur. Proceed for Dhuadhar Waterfall in Bedhaghat. High Tea to be provided in the evening before proceeding to Train Station. Dinner & overnight on board. Breakfast and Lunch on board. Arrive at Delhi Safdarjung Railway Station by late evening. Tour Ends with Happy Memories. Indian visa fees, if any. (A)# Above rates are valid for Indian Citizens only. (B)Additional Surcharge of Rs. 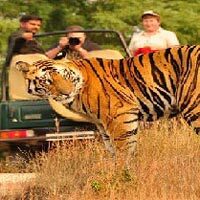 4,000/- Per Person will be charged extra from Foreigners for the Safari Booking at Bandhavgarh and Kanha. It is mandatory to mention the number of ID Proof at the time of booking and ensure to carry the same ID proof on while travelling on the trip.